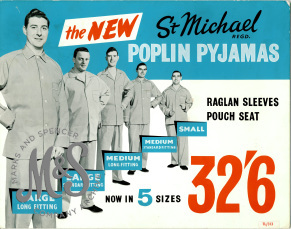 Design on board for 'The New St Michael Poplin Pyjamas', now in five sizes from small to large long fitting. The same design is on both sides, one side has been drawn on in pencil. 35x28cm. Staff from the Buying Department were used for this advert, rather than the usual external models.